I’ve been using the oil cleansing method for a while now. You will find many variations on how to do this, but below is what works for me. I have combination skin (more like oily and normal), and hormonal cystic acne. I started using Coconut Oil on my face. This did help some, and fortunately, the coconut oil didn’t clog my pores too badly. I say “fortunately” because Coconut Oil is high on the Comedogenic scale. It may be good for a lot of things, but cleaning your face isn't one of them (for most people). Then I read something about Castor Oil. Castor oil has been used for eons for all kinds of skin conditions (including eczema) to soothe, moisturize and treat acne. 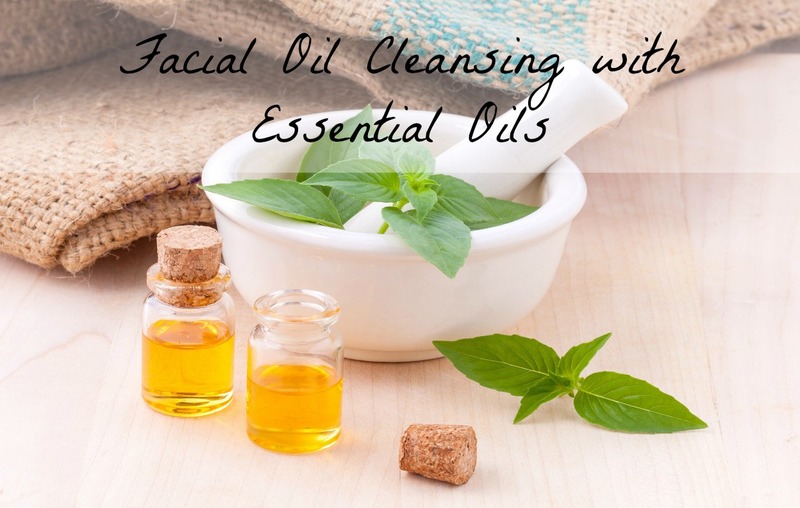 Most Oil Cleansing recipes call for a combination of Castor Oil and some other oil such as grapeseed (high in anti-oxidants), Jojoba (closest to your own facial oil), Olive Oil, etc. Around the same time I started playing around with Essential Oils, so I decided to combine the two things for my own homemade super cleanser. For the last two years, I have used this basic recipe, sometimes with different essential oils, and I have also tested these on some of my friends as well, and they are still my friends, and still requesting either the recipe or for me to make more, so it worked for them as well. 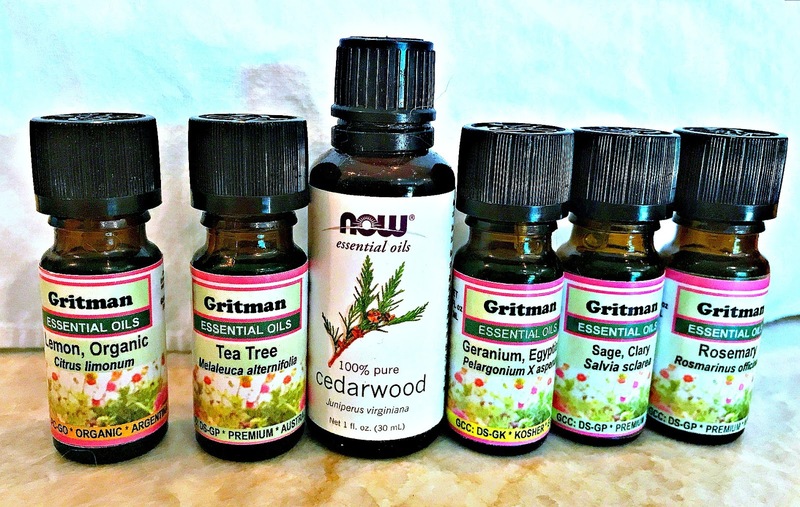 This recipe has a bunch of ingredients (although all common essential oils), but you don't have to use all of these oils. Now that I am in my 40's I thought I might try to add some essential oil age busters. I will have more information at the end of the post on how to vary the basic recipe it to fit different needs. Step 1: Rub the oil into your face. I do this for about 30 seconds to a minute depending on how long I want to massage my face. If it’s been a stressful day, longer. Some methods will say rub the oil into your face fro 5 to 10 minutes. I don't have that kid of patience or time. Then I let the oil sit on my face for two minutes. I know it’s two minutes because I brush my teeth with my electric toothbrush (which I love, btw. Highly recommend you get one.) while this is happening. You don’t have to be so precise with the time. Step 2: Take a HOT, wet washcloth, and put it over your face. I cannot tell you how good this feels. After it cools down, wipe the oil from your ace with the wash cloth. Rinse and Repeat. Repeat this step a couple of times to get all the oil off of your face. I usually just do it twice, and I'm good to go. Don’t forget to pay attention around your hair line. That’s it. Two steps that feel amazing. * When buying essential oils, look fro ones that are 100% pure. Fill the bottle half way up with castor oil (cold pressed). Use more castor oil if you have oilier skin, and less if you have drier skin. Add 20 drops of Lemon and Lavender. 5 drops each of Clary Sage and Geranium. Shake it up, rub a little on the back of your hand to see if you want to add some more oils. I doubled all the ingredients (except Lavender because I was out), but I don’t have really sensitive skin. I would recommend you have a back up bottle in case you use too much essential oils, and it bothers your skin. 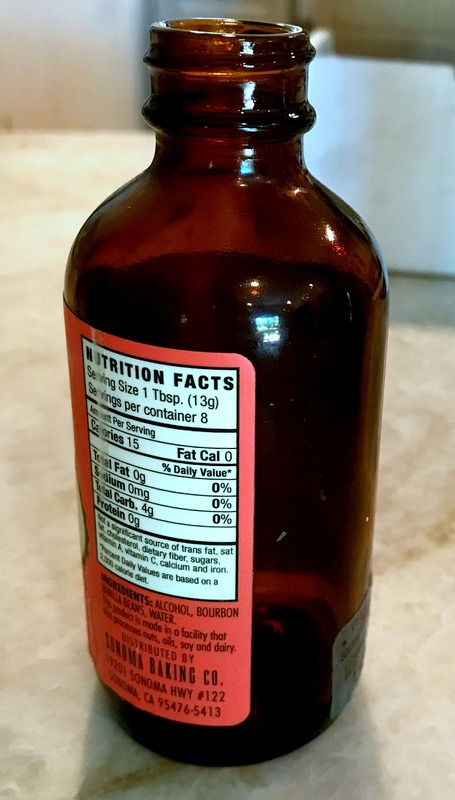 You can use the second bottle to half the recipe. If you are nursing or pregnant, or have other health conditions that you are worried about consult your doctor because some essential oils aren’t recommended. You may need to play with the ratios of Castor Oil to other Oil to find what works for you. 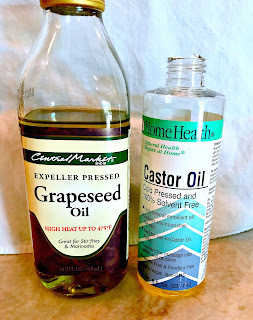 The oilier the skin, the more castor oil you use, but if you notice it is drying to your skin, increase the other oil that you use and decrease the castor oil. Also, it is normal to have minor breakouts when you first start using the oil until your skin adjusts, but if you are having a big break out or flaking skin, then stop using it. There are a few people who have experienced allergic type reactions to castor oil (or any of these ingredients for that matter). If you think you might have sensitive skin, do a test patch (somewhere hidden by hair or something). You can modify the amount of ingredients. For example, if anti-aging is important to you, use more Clary Sage and Geranium. I personally don’t like the smell so much, so I only use a little. Sandalwood and Frankincense are also good for aging skin, but the real stuff is outrageously expensive, so I use my Sandalwood diffuser only, and the Frankincense I'll mix a drop in with my face cream. But, that’s because I’m cheap. Both are suppose to be have amazing, anti-aging properties. I have also used Jasmine and Ylang Ylang just for the smell (I only use a little though because these two are strong! ), and one time orange oil and that smelled super good. So play wth the oils. The only thing I would say is have at least one antibacterial/antimicrobial one in your mix. Tea Tree is usually my "Go To", and it's pretty inexpensive. Castor Oil and Jojoba (75/25 or 60/40) Tea Tree Oil and Cedarwood, and some Lavendar. A word on Olive Oil. Some people swear by it, others curse it. Olive Oil is packed full of anti-oxidants and is very emollient. However, Olive Oil has a tendency to break some people out, but if you have dry skin, then this may be a good oil for you. Other oils that are good for dry skin are Avocado Oil, Argon Oil. Why these ingredients? What are the benefits of using them? Skin care: Lemon oil is a good remedy for increasing the luster of dull skin. It is astringent and detoxifying in nature, and rejuvenates sagging or tired-looking skin. Its antiseptic properties help in treating pimples and various skin disorders. Lemon is also recommended for reducing excessive oil on the skin. Stress: Lemon oil is calming in nature and therefore helps in removing mental fatigue, exhaustion, dizziness, anxiety, nervousness and nervous tension and may help oil helps in increasing concentration and alertness. Lavender essential oil inhibits the bacteria that cause the infection that causes acne. It helps to regulate some of the over-excretion of sebum by hormonal manipulation, and can reduce the signs of scarring after the acne has begun to heal. Word of Caution: As with many other essential oils, pregnant and breastfeeding women should avoid using lavender essential oil. It is also recommended that patients with diabetes stay away from lavender oil. It may also cause allergic reactions to people that have unusually sensitive skin. Some people may also witness nausea, vomiting and headaches due to either common or excessive use of lavender oil. A Few Words of Caution: Cedarwood Oil may produce irritations on the skin if used in high concentrations. Pregnant women should avoid its use altogether, and others should speak with their doctor before making any sort of drastic change, or adding something new to their dietary regimen. Added Bonus: Rosemary essential oil can stimulates mental activity and is a good remedy for depression, mental fatigue, forgetfulness, and reduces stress. Tea Tree oil has been shown to heal wounds quickly and protects them from infections. Furthermore, it can help neutralize or diminish the scar marks and after spots left by eruptions, boils, pox, and acne. Melaleuca oil can quickly clear up the sebum glands and eliminate the bacteria, resulting in smoother, healthier-looking skin in a surprisingly short amount of time.It has powerful antioxidant properties that can significantly improve the appearance of blemishes and scars. It may also be helpful in reducing the appearance of age spots and other beauty marks and reducing appearance of wrinkles as we age. Clary Sage has an ester present in it called linalyl acetate, which reduces skin inflammation and heals rashes. It balances and regulates the production of natural oils in the skin, reducing both oily and dry skin and makes your skin look young and beautiful. Geranium Oil speeds up the healing process of wounds, and it is antibacterial and antimicrobial. It also helps the scars and other spots on the skin to fade and vanish. It facilitates blood circulation just below the surface of skin and also helps promote a uniform distribution of melanin.